In the US, there are 10 million people who cannot get out of bed without assistance. Caregivers use a handful of methods to assist this transfer between bed and wheelchair, but all require significant training and physical involvement from the helper. The absence of an easier method keeps many people trapped in their beds. 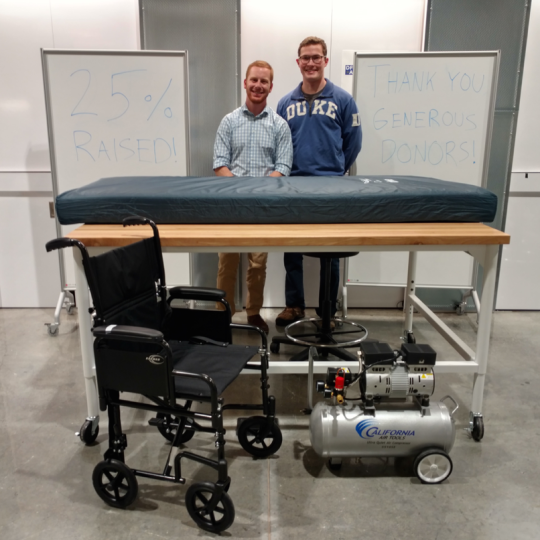 This project seeks to show feasibility for a device that can scoop, lift and transfer a person with custom-built inflatable bags. A full-size device would provide patients and caregivers a new solution to a crucial daily task. Every day, more than 10 million Americans need a caregiver’s assistance to get out of bed into a wheelchair. For people living with disabilities, this is usually the biggest obstacle to mobility within their home or health care setting. In homes, hospitals, and nursing facilities, performing this transfer for fully immobile patients is a complicated and labor-intensive task. There are devices to help with this transfer, but even the best current methods are inadequate for our society’s rapidly aging population. Our startup, Zephyr Mobility, began in March 2016 with a grant from the Innovation Co-Lab. In the last year, we have developed a completely new method for performing the transfer that is significantly safer, faster, more comfortable, and easier to use compared with current methods. Our current stage is prototype construction and customer discovery. We’re visiting facilities to learn their experiences with this problem in great detail and figure out how our solution can be most valuable to them. Through the Melissa & Doug Program, we have committed to working on this project full-time in summer 2017. We’re excited for this chance to focus on Zephyr Mobility and make lots of progress. Thank you to all our advisors and supporters, both at Duke and in the broader Durham community! If you’d like to learn more, please email sfox@zephyrmobility.com with questions or comments. Sunday August 14: the prototype bag design is working well for now. It’s having trouble with higher pressures, but that isn’t a problem since I only need low pressures to experiment with the maneuvering mechanism. All materials are being sourced from Home Depot or online. It’s taken me a while, but I finally found the right solenoid valve for easy switching of air pressure between bags. It’s lever-activated, like a joystick, and it will remove the need for any control electronics at this stage.